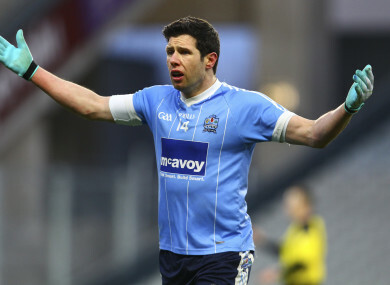 Sean Cavanagh has spoken out about the recent incident which left him hospitalised and Moy’s decision to appeal Tyrone CCC’s findings. SEAN CAVANAGH SAYS he hasn’t watched back the video footage of an incident which left him hospitalised after Tyrone SFC action with his club Moy. The former Tyrone captain suffered a broken nose, concussion and extensive facial injuries in a loss to Edendork on 15 September, a game which was marred by scenes of violence and hit the headlines as a staggering 27 cards were dished out. Officials ruled that the incident involving Cavanagh merited no on-field sanction, and this decision was backed following an investigation by Tyrone’s Competitions Control Committee (CCC). They ruled that the injuries were accidental and confirmed that there would be no disciplinary action, but Moy are appealing the decision. Cavanagh’s club released a statement on Tuesday after watching video footage, expressing their ‘disappointment and dismay’ and calling on officials to ‘review the footage again to reconsider their opinion’. Yesterday, three-time All-Ireland winner Cavanagh revealed that he was yet to see the footage, has no intentions to do so but ‘has to go with’ his club’s interpretation. “No, I haven’t seen the footage,” he said at the Electric Ireland GAA Minor Star Awards in Croke Park. “If you were involved in a car crash I’m not sure why you would want to see it again. “It’s like anything, I know there’s going be a level of interpretation involved. I’m sure if you talked to someone in the Moy, they will tell you something different than someone from Edendork. “I am just letting that process happen and just trying to keep my head down, trying to clear my head as much as anything else. (I’m) still suffering a little bit from concussion and still a wee bit off but thankfully on the mend. While there have been some high profile incidents and violent scenes in Tyrone and Ulster club football over the past few weeks, Cavanagh feels that it’s an issue across the entire country. “I think it’s probably all football,” he said. “I think in Tyrone, sometimes maybe we’re not good at the PR side of things and we don’t do ourselves any favours but I think there’s certainly some nasty things that happen in Gaelic football fields up and down the country. He’s called for a second referee in conversation with The42 before and reiterated that isdea, saying that the standard of officiating needs to improve and that taking harder stances on sanctions may also resolve some issues. While still recovering from his injuries, Cavanagh, who was player-manager for Moy this year, has one eye on 2019 and his return to the club scene. “I enjoyed doing a bit of both and seeing the other side,” he said. “We’ve a good group of lads in the Moy and it’s just disappointing the way the year ended that I couldn’t… I left the field after 15 minutes and it turned into a bit of a messy game obviously. “But look I’ve enjoyed it and I would be an optimistic person by nature so I think playing county football for so long and seeing so many highs and lows allows you to move on quite quickly. “So after a couple of days of feeling sore with the whole thing, mentally and physically, I’m now at the stage where I am looking forward rather than behind, that’s what an awful lot of sports players can do. Email “'If you were involved in a car crash I’m not sure why you would want to see it again'”. Feedback on “'If you were involved in a car crash I’m not sure why you would want to see it again'”.